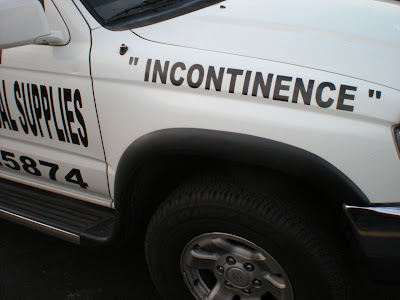 The “Blog” of “Unnecessary” Quotation Marks: for under the table incontinence drugs? The word incontinence on a vehicle is funny in any case, when the accuracy of the word is cast into doubt, that's just a smidge funnier. Thanks, Kyle. Guess the company was a bit P****d when their new slogan was 'leaked'. "Thank you, 'Oops, I Crapped My Pants'! And I just did."